Close to the world's tallest statue of the goddess A-Ma (or named Tin Hau) on the mountaintop on Macao's Coloane Island, A-Ma Cultural Village is a 7,000-sq. m. cultural complex which celebrates the legend of the Goddess of Seafarers. 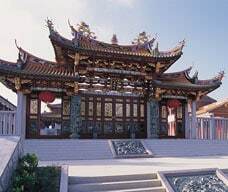 The village architecture mainly comprises a pavilion-style front gate, a carved marble altar, Tin Hau Palace, Dressing Hall along with Bell Tower and Drum Tower. 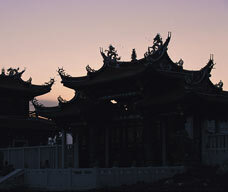 The grand complex attracts A-Ma devotees and interested tourists alike for a visit. Nearby, Visitors can refresh themselves at the park next to the village, or follow the hiking trail up to the magnificent A-Ma Statue on hill top and enjoy a captivating view of the island. 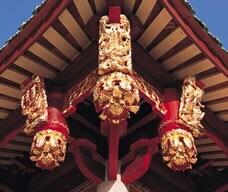 Opening hours of Tin Hau Palace: 9 a.m to 6 p.m daily. There is shuttle bus service between the Façade at Estrada de Seac Pai Van (at the foot of the hill) and Tin Hau Palace in every 30 minutes. Please visit website of A-Ma Cultural village for more information.